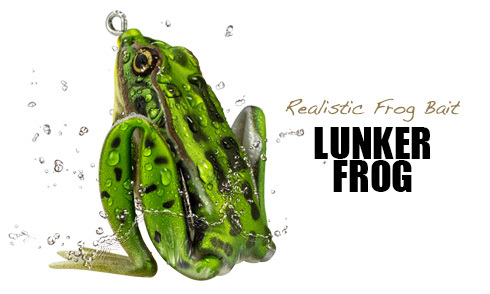 The Lunkerhunt Lunker Frog is the most life like frog currently available in the industry. 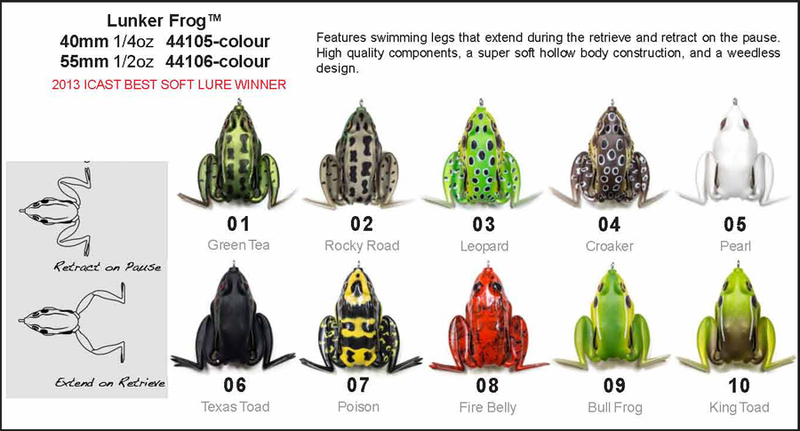 It features an amazing swimming leg design that replicates an adult frog and has swimming legs that extend during the retrieve and retract on the pause. At rest the Lunker Frog is 2.5 inches and will extend up to 4.5 inches on the retrieve. The Lunker Frog behaves just like a living frog would in the water. At rest, the body of the Lunker frog drops down a little into the water perfectly replicating the action of a frog/bullfrog. Designed with a soft-body that collapses easily upon attack and quickly exposes its razor-sharp double frog hook this also results in higher hook-up percentages. The Lunker Frog features high quality components, a super soft hollow body construction, and a weedless design.